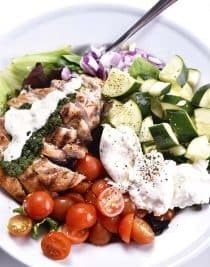 Grilled Chicken Salad with Pesto Ranch Dressing Recipe makes a delicious salad with cucumbers, tomatoes, onion, mozzarella topped with grilled chicken and a pesto ranch dressing! 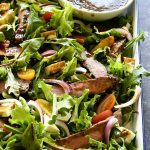 While the chicken is grilling, I prep all of the veggies for the salad – slicing the cucumber and tomatoes, dicing the red onion and washing and drying the salad greens. Then, I assemble it all onto a large platter or in a salad bowl and set it aside for the chicken. I also go ahead and make my Pesto Ranch Dressing. 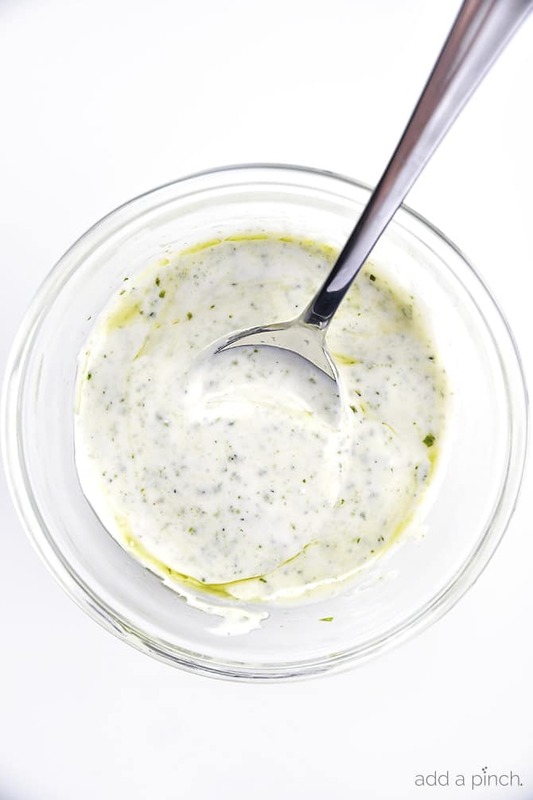 Usually, I have buttermilk ranch dressing ready in the refrigerator and you already know about my deep love for classic basil pesto! I can’t get enough of it and have been using it as fast as I make a batch this year. So much for my big plans on doubling my stockpile for winter! Ha! Once the chicken has cooked through and rested, I slice it and add it to the top of the salad. 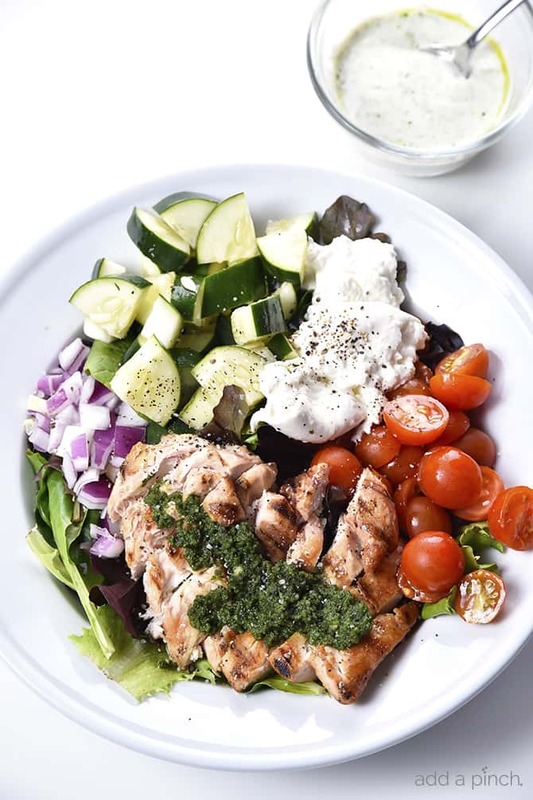 I then serve the salad with a spoon of pesto on top of the chicken and the pesto ranch dressing on the side for everyone to add just the amount of dressing they prefer for their salad. 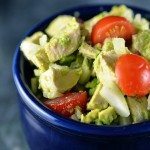 This grilled chicken salad is super make-ahead friendly! You can easily prep all of your salad vegetables as soon as you get home from the grocery store and store in individual containers ready for grab and go salad assembly. During the summer, we also love to take care not to heat up the kitchen or even the back porch more often than we absolutely have to. So, when we cook the chicken, we generally plan for all of the chicken that we’ll use that week and cook it all at once. I then store it in a large container ready to be used throughout the week in cold salads or wraps. I also like to make all of my salad dressings ahead of time and store them in the refrigerator. 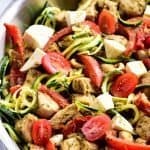 While these make-ahead steps may take a little time when you do them, they certainly speed up lunches and suppers throughout the rest of the week. 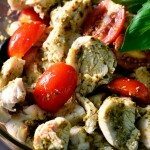 Here’s my Grilled Chicken Salad with Pesto Ranch Dressing Recipe. I hope you make it soon! Drizzle or brush olive oil onto grill or grill pan set over medium heat. Grill chicken on both sides until browned and completely cooked through. The time will depend on the thickness of the chicken breasts, but should register 165º F when tested with an instant read thermometer. Allow the chicken to rest about 5 minutes. 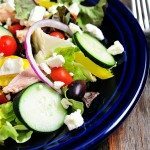 Meanwhile, add the salad greens to a large salad bowl or platter. 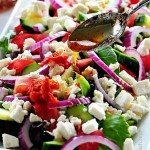 Add cucumbers, tomatoes, red onion, and mozzarella (or burrata) to the salad. Once the chicken is ready, cut into slices and add to the top of the salad. Top with a spoonful of pesto and serve with dressing on the side. Stir together the ingredients for the ranch dressing as directed in the recipe. Add the pesto to the ranch dressing and stir until well combined. Thanks for sharing this delicious recipe. 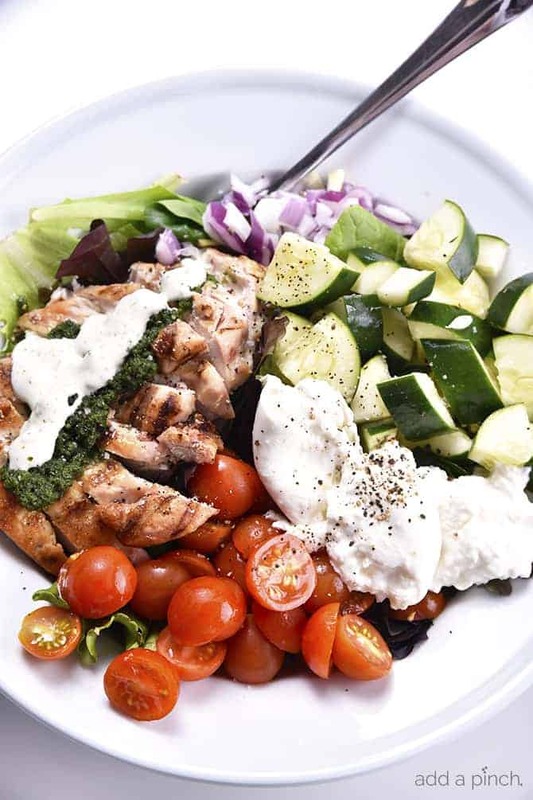 This Grilled Chicken Salad with pesto ranch dressing seems to be very flavorful.